The Thirty Meter Telescope (TMT) project will unveil a polished mirror assembly - a key piece of astronomy's next-generation telescope - at the 2014 annual meeting of the Canadian Astronomical Society (CASCA). The assembly will be unveiled at a reception at 5:30pm EDT, Monday, June 9 at the Hotel Chateau Laurier, in Quebec City, Canada. The assembly is a demonstration model of just one of the 492 mirror segments that will ultimately comprise TMT's giant 30-meter primary mirror. 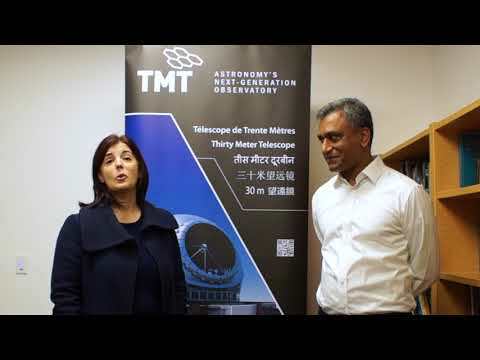 TMT is a revolutionary telescope slated to begin operations in Hawaii in the 2020s. "We are delighted that the first presentation of these sophisticated mirror assemblies is happening right here at CASCA 2014," said Laura Ferrarese, CASCA president. "For the past decade, the Thirty Meter Telescope has been the top priority for the Canadian astronomical community, and we have worked tirelessly with our international partners to design this marvel of engineering. The science TMT will deliver will be transformative for astronomy, in Canada and worldwide." The polished mirror assembly displayed at CASCA, though a prototype, has nearly all of the features of a production version. The hexagonal 1.44-meter diameter mirror is made of a 45-millimeter-thick ClearCeram glass produced by the Japanese company OHARA and procured by TMT's Canadian partners. The glass has "zero expansion" properties, meaning it retains its precise figure irrespective of changes in temperature. Within the mirror's support assembly, 21 actuators can fine-tune the mirror's shape for optimal telescope performance. The prototype assembly weighs about 220 kilograms. "Given the extensive involvement by Canadian scientists and engineers in the technology development of TMT, it is fitting to offer the world a first look at a polished mirror assembly—the application of all that hard work—right here in Quebec City," said Ernie Seaquist, executive director of the Association of Canadian Universities for Research in Astronomy (ACURA). An organization of 20 universities dedicated to the advancement of university research in astronomy and astrophysics in Canada, ACURA is an associate of the TMT project and one of its original members. The production segments will include an extremely reflective mirror coating, and edge sensors that sense the height and tilt of neighboring mirror segments, allowing for precise positioning of each segment relative to the other segments. Together, 492 of these mirrors will work together as a single optical surface comprising TMT's 30-meter-diameter primary mirror. "Being able to showcase this polished mirror assembly to the scientific community and the general public is very rewarding," said Eric Williams, the Optics Group leader for TMT. Williams has been working on designing and testing elements of the assembly for nine years. TMT is identified as the highest priority project by CASCA in "Unveiling the Cosmos: A Vision for Canadian Astronomy, Report of the Long Range Plan 2010 Panel". This plan, released in 2011, is the result of a detailed survey of the challenges and opportunities over the 2010-20 decade. Through ACURA universities with support from the Federal Granting Councils, the National Research Council of Canada, and provincial funding, the Canadian astronomical community has contributed important work to TMT over the last decade in two key development areas. Canada has been designing the telescope facility's large aerodynamic enclosure. The innovative enclosure design features a circular opening that minimizes the wind-induced vibrations of the telescope structure while optimizing air-flow around the building to reduce distortion of the light collected by the telescope's giant mirror. The contractor for the enclosure work is Dynamic Structures Ltd., based in Port Coquitlam, British Columbia, whose parent holding company is the Canadian firm Empire Industries Ltd.
Another major Canadian initiative has been the development of TMT's "adaptive optics" system, called the Narrow Field Infrared Adaptive Optics System (NFIRAOS). Adaptive optics removes the blurring effects of the Earth's atmosphere, greatly increasing the acuity of astronomical images and allowing astronomers to study very faint and distant objects in the universe. To date, Canada has invested more than $30 million in TMT. The TMT project plans to begin construction later this year. As an Associate in the TMT International Observatory, Canada continues to be engaged in the project.